Due to trends like the widespread adoption of smartphones, customers are more informed than ever, and they demand real choice when it comes to selecting and purchasing goods. Providing the best customer service is crucial, but it’s also leading many to put cyber protection on the backburner, making them appealing targets with high returns on a hacker’s investment. On top of this, traditional defenses are no longer enough to protect credit card data and other critical information. 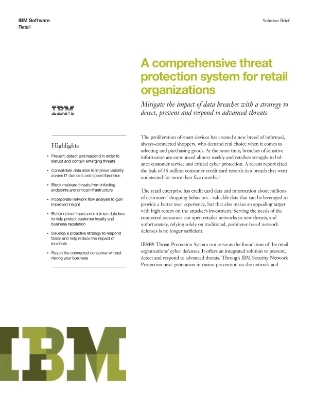 This informative solution brief highlights the challenges and potential solutions that can be implemented to deal with the new threats that face merchants today while also helping to embrace mobile users, protect payment and personal data and deliver a secure shopping experience to customers.